With the complexity of utility billing, and the many factors that go into it, most accounts payable staff simply look back to the previous month to determine if they are on-target for spending. But with Audicon’s skilled analysts, who can decipher a utility bill and look for errors and overcharges, your business can realize savings of as much as 35% on your gas, sewer, water, and electricity budget. Audicon doesn’t charge if we don’t find any savings. The first step is for our analysts to go over your utility bill, looking for any errors or overcharges on your bill, for which you can be reimbursed. They also look for savings that can be achieved through fixed monthly cost, long-term savings, or any combination of rates and regulations. Like other energy companies, we have a process for getting you the best results for your utility spending. After we analyze where you can save, we seek bids from our many suppliers. These suppliers will go to bid for your usage, and you will see the bids in real time, online or via hosted conference call. An Audicon Representative will serve as host and guide you through the process as you sit, watch and wait for the provider with the plan for optimal savings. You then choose the supplier that offers the best plan. Want to get started? Call today, or fill out the form, to learn more about saving on utility costs. The Audicon team is comprised of skillful analysts who review electric, gas, water and sewer bills verifying accuracy. Many accounts payable departments will pay bills based on if the usage or charges are in line with the previous month and understand that some months will vary based on the season of the year. There are many different factors that go into the billings of the utilities which can be very confusing to the staff that approves and pays the bills. Our analysts decipher the charges and will look to see if there are any errors or if there are savings we can achieve through fixed monthly cost, or by long term savings, whether by correction of errors, rate change, or any other combination of rates and regulations. Audicon works on a contingency basis. We simply share in the savings! If we do not find any savings we do not get paid. Audicon partners with many energy suppliers who offer discounted pricing for electricity and gas services in the deregulated areas of the US. 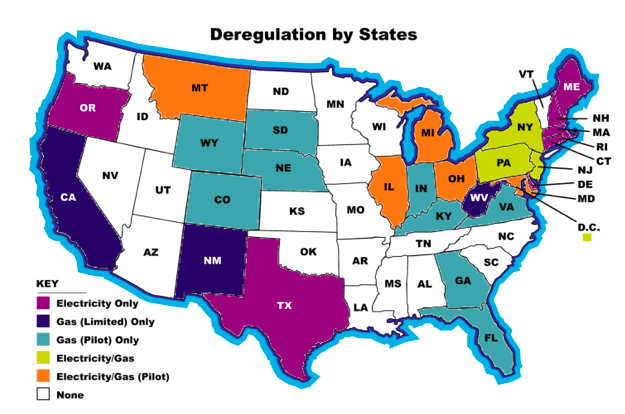 See Map below to determine if your utility/state is deregulated. We have many suppliers that we can go to bid for your usage. We then will present you with the offers and recommend who we believe is the best fit for your organization. We have a unique offering that will get the best lowest cost per KWH and/or therms through a reverse auction. The top suppliers will bid on your usage, in real time, online on a conference call, with a Representative who will host the call and explain the process. You then sit, watch and wait for all suppliers to bid for your business. You choose the provider with the best price to achieve the optimal savings! Audicon partners with a National LED Lighting company who is one of the most experienced and respected energy efficiency firms in the USA. Why change to LED Lighting?